More than fifty years ago, this lane led to Brophy's Field, a mecca for the soccer-mad young men of the town. It could be said that this small patch of mostly bare earth was the unofficial cradle of Portlaoise AFC, founded in 1966. The ground is built on today. As shown on an 1839 map, this laneway was where the old Abbeyliex Road reached the Square. 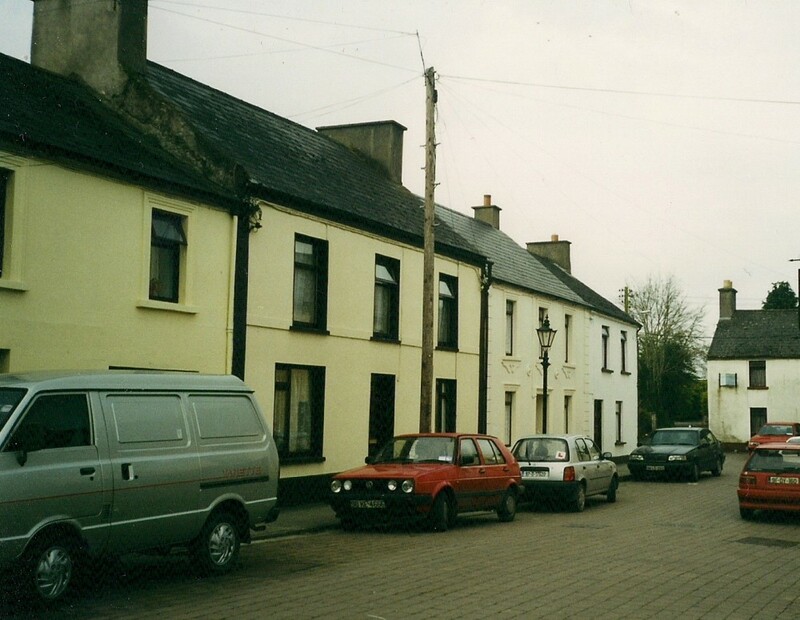 It wasn't until the mid-19th century that the Abbeyleix Road as we know it today, aligned with Coote Street, entered the town. Marked on the same map are the ruins of a Poorhouse which stood on the old road between the Square and what was then a Military barracks. The barracks was built in 1808 to replace a Cavalry barracks in Tower Hill, across the road from where the Christian Brothers school is today. As described earlier, the last of the British soldiers left in 1922 and the barracks became the Garda Station. Built in the late 19th century, this terrace replaced earlier houses here. In 1851, the representatives of the late Robert Onions of Bloomfield (died 1843) were the immediate lessors of these four houses. For almost two hundred years, the Onions family - subsequent generations of which lived in Borris House - owned much property and land in and around the town. Into living memory, the field which became the Town Park in 2000 was known as Mrs Onions' Field. In Griffith's Valuation, Peter Lalor is listed as the first occupier of this house, but he was soon followed by a veritable litany of others; Henry Mathews (1855), Daniel Keegan, Boot & Shoemaker (1860's/'70's) and Joseph Templing, a Whitesmith (1881). With regard to the latter, see entry for No. 5. Is it possible that the Cancellation Book entry is incorrect and Joseph was in fact living in No.5? Ellen Chandler was here in the 1890's (see also entry for No. 23), as was, in 1901, Catherine McCormack, a widowed shopkeeper and her young son and daughter. She also kept four boarders, three of whom were Railway Porters. Her son Michael T. (1890-1965) eventually became a tailor and his wife Elizabeth was renowned as musical director of countless productions in the town. Many people I've spoken to have vivid recollections of her seated regally at the piano. A measure of her popularity is that, more than half a century later, some people recalled with pleasure her production of Snow-White and the Seven Dwarfs in the Macra na Feirme Hall in November 1958. The family headstone, incidentally, is adorned with musical notation. It was the McCormacks' 14-year-old daughter Mary-Jo who, at five a.m.in the morning, raised the alarm about the fire in the Town Hall (see next page). Nine years later, the local paper reported that 'pretty Mary-Jo was crowned Queen of Dalkey Island amid scenes of Irish Pageantry'. 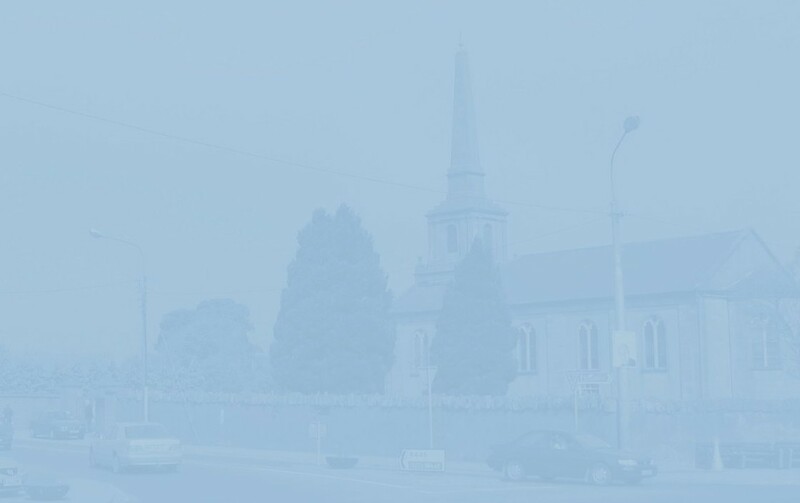 Another litany, starting in 1851: Mary Byrne, John Dunne (1855), Timothy O'Rourke, Margaret Mulhall, Joseph Bergin (all 1860's), Andrew O'Neill (1870's), John Lyons (1882) and Thomas Quinn (1892) who succeeded James Bergin as Weighmaster of the Public Weighing machine. At the turn of the 20th century, James and Norah Sullivan, from Tipperary, and family were living here. He was a Railway Guard; like most of the wives at the time, Norah was a Housekeeper, and their eldest daughter, Mary, a seamstress. Within two years of her name going on the 1901 Census Form as a 'Scholar', their daughter Johanna was dead, aged 18. Her father died in 1906 and, in 1911, his widow was still here with her two daughters, Brigid and Maggie, both described as 'Grocery Shop Assistants'. Mrs Sullivan also kept two boarders; James Conroy, a Post Office Linesman, and a Royal Engineer, Englishman William George Claridge. Mrs Sullivan herself passed away in November 1915. In the 1930's and 40's there was a shop here run by the Talty family. The premises was vacant in the late 1960's and, for a while in the early '70's, it housed a washeteria (Bubble Bright) run by Daniel and Margaret Donoghue. Patrick Neale (1850's), followed by Thomas O'Neill (1870's), John Haslam (1880's) and Thomas Hayes (1890's). For many years, from at least 1900, the home of the Dalton family - Richard, a native of Kildare, and his wife Kate (from Wexford). He was a Fowl Dealer. In 1901 they had six schoolgoing children and an infant. A decade later, only the four youngest were still living at home. One of their sons, Richard, known as Dickie, on Fair and Market Days, operated a mobile weighing scales owned by the Town Commission. For heavier loads there was the previously mentioned 'Public Weighing Machine' or weighbridge behind the Town Hall. It was removed in 1959. In 1911, incidentally, another Dalton, William, described as a Poultry Dealer, was living as a boarder in a house owned by Edward Fitzpatrick a very short distance away in Old Barracks Lane. Fairly rapid turnover in the occupancy of this house as well: Henry Murphy, John Ryan ( both 1850's), Mary Delaney (1860's -'70's), Bernard Harris (1875), Margaret Slattery (1882), Laurence Holohan (1885) and John and Bridget Brennan (1892 - 1900). In 1901, Bridget Brennan, now widowed, lived here with her six schoolgoing children. She is listed as 'Housekeeper'. Also in the house on Census night was a boarder, Thomas Tiernan, an Engine Driver from Dublin. In 1911, James Ward, a Monaghan native, lived here with his wife Mary Anne and their three children. He appears on the Census Form as an 'RIC Pensioner'. (See also the entry for No.24). From the 1920's, Michael Donoher was here, followed by John Fennell (1940's and '50's) and for many years from the 1960's, Mrs Brid Foster. The address of the partly visible house facing us was formerly Old Barrack Road but, in modern times, No. 25 Market Square. In 1901, it was home to four distinct families: William White, a 76-year-old widower and retired Millwright; Julia Grace, a 70-year-old widow and Seamstress; Richard O'Brien, a Mill Labourer, his wife and young family; Michael Brennan, a Carpenter, his wife Johanna, a Dressmaker, and their young family. Other occupants of this house included the family of William and Annie Rogers. Now long resident in England, Joe Rogers has written fiction for adults and children, drama, and autobiography. In the latter genre, From an Irish Market Town gives a graphic account of what it was like to be a young lad in the Portlaoise of the '30's and '40's. American-born Julia Moffitt - usually known as Judy - also lived here and she was a bit of a character: In her black ensembles, furs, and bunch of jangling keys (hence her nickname; 'Jingle Bells'), she cut a striking figure gliding through the Square, firing the imaginations of generations of youngsters. Apparently, she kept seven hens, each called after a day of the week, and could be heard calling "Here, Monday" and so on..... And for reasons best known to herself, she is reputed to have kept a bicycle underneath her bed. Two stories that should be taken with the proverbial grain of salt? This house was subsequently the home of Gerry McMahon, an electrician, originally from Donegal, and his family.